Download and Install Scramble With Friends on the BlackBerry PlayBook! 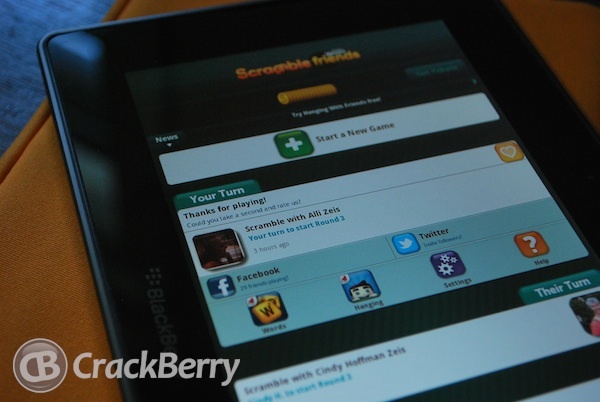 Want to play Scramble With Friends on your BlackBerry PlayBook? If you have a few minutes to spare and a bit of tech knowledge, you can do just that. With just a few steps you can install Scramble With Friends on your BlackBerry PlayBook and you'll boggling for hours on end. Just head into the CrackBerry forums and pick up the latest Scramble With Friends BAR file, then keep reading to get it up and running on your PlayBook! Enter your the IP address of your PlayBook (found by tapping the Development Mode icon in your status bar) or click "Scan". Enter the password you chose, then click "Connect". Click the "Add" button and browse for the BAR file you want to install. You can find a list of available BAR files here. When the process is complete the application will be installed on your PlayBook. Make sure you Mac OS is up to date and then download the Playbook_Tools here. Put your BlackBerry PlayBook into Development Mode by going to Settings > Security Settings and note the IP address of your PlayBook. You'll also be required to enter a password here if you don't have one already. Don't forget your password!! Type the following into Terminal: java -Xmx512M -jar BarDeploy.jar -installApp -device PLAYBOOK_IP -password PB_PASSWORD appname.bar Be sure to add in your PlayBook IP address, password and the name of the .bar file.